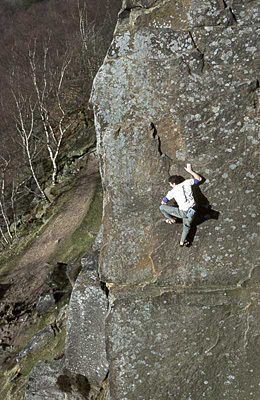 It all began in the summer of 1984, when Alan as a young climber decided to attempt a climb named Brown’s Eliminate, at Froggatt Edge in the English Peak District. Note the absence of a rope in this picture. You either climb Brown’s Eliminate on a safety rope from above – which doesn’t count – or you Don’t Fall Off. The picture – © Carl Ryan, who was very gracious about granting permission to use it – isn’t by or of me or anybody I know. The normal way of doing Brown’s Eliminate starts up a much easier route on the right, then moves out onto the face along the narrow ledge you can see just below the climber’s feet in the picture. I had already done it this way and found it straightforward. The direct start, which is considerably harder, comes straight up to the left end of the ledge; the hard bit is getting to the ledge, about 20 feet off the ground. The landing zone is flat but hard: hitting it from 20 feet isn’t life-threatening but is guaranteed to be unpleasant. As I was about to find out. The kids these days use crash mats for this sort of thing, so I’m told. Twenty years ago we just used Moral Fibre. Ha! According to the guidebook, the direct start should have been about at the limit of my abilities in ideal conditions. Conditions weren’t ideal – it was a hot, humid day in July, exactly the wrong weather for climbing gritstone where friction is everything – but I was young, arrogant & stupid and I thought I could pull it off anyway. Just below the ledge it all went horribly wrong. There was clearly no way I was going to reach the ledge in control. The climbing up to that point had already been tricky and I didn’t think I could get back down either. The right thing to do at this point would probably have been to jump off; I could have landed in control and probably got away with a bruised ankle or two. But jumping off was too scary. I knew if I could just reach the ledge, the rest was much easier. So I jumped for the ledge. Reached it with one hand, couldn’t hold it ... bang. Five minutes with Excel and my faintly remembered school physics reveals that (assuming negligible air resistance) a body falling 20 feet hits the ground at 26mph. Lots of bits hurt. I was still able to walk so I hitched home and took myself to Accident & Emergency at my local hospital. What they spotted at the time was a broken left wrist and some strained ligaments on the outside of my right knee.